TLS (as SSL), is a protocol that provides security across a network. It guarantees privacy by encrypting each message (no one else can see the data), providing integrity with an authentication code for each message (no one else can modify the data) and confirming authenticity of each party’s digital certificates (no one can pretend to be someone they are not). When it comes to authentication, the server sends the client it’s certificate, so it can check whether the server is to be trusted. This is determined by analysing the certificate’s digital signature: if the signing entity that’s verifying the certificate is trusted then so is the certificate. That entity is usually a well known certificate authority (CA) that all clients trust. The same process is repeated from client to server if both ends need authenticating, as in two way authentication. For this step it’s important to note that, at the very least, a server will need it’s own certificate and a client will need a list of trusted ones. 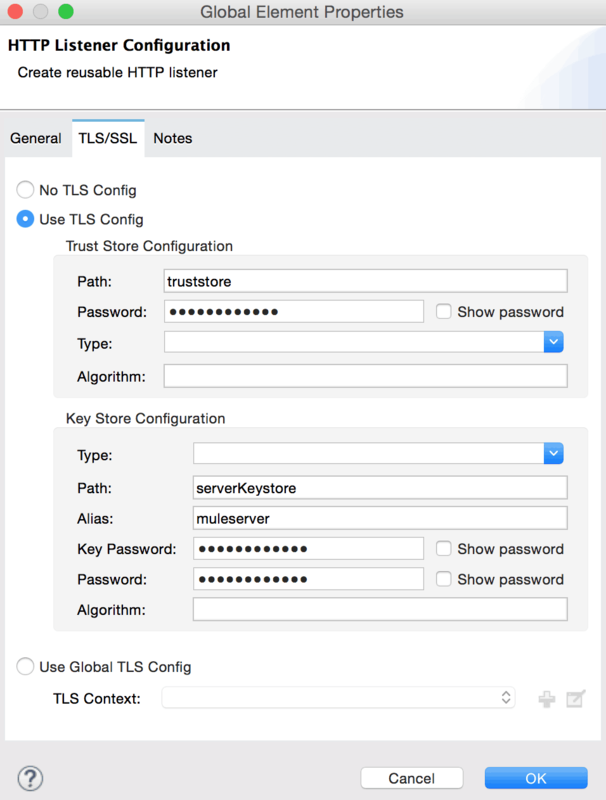 Setting up TLS/SSL with Mule has always been a pain point, mainly because each connector has had its own way of dealing with it. 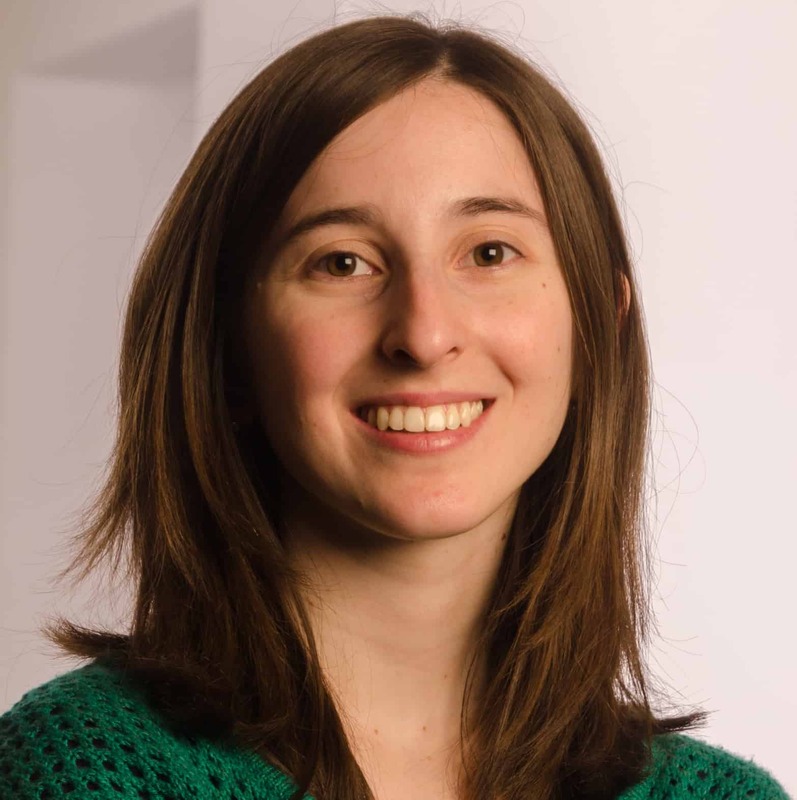 That’s why in the 3.6 release we introduced the TLS context component, currently used by HTTP, OAuth, and the WS Consumer, but meant to become the standard for all connectors requiring TLS. The other piece of the puzzle is the setup of allowed protocols and cipher suites. 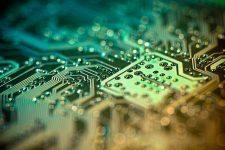 These can be rendered insecure from one day to another because of a new exploit (think POODLE and SSLv3) so being able to decide which protocols are to be used is of utmost importance and a system administration’s main concern. That’s where the runtime’s TLS configuration file (found in MULE_HOME/conf) comes in. 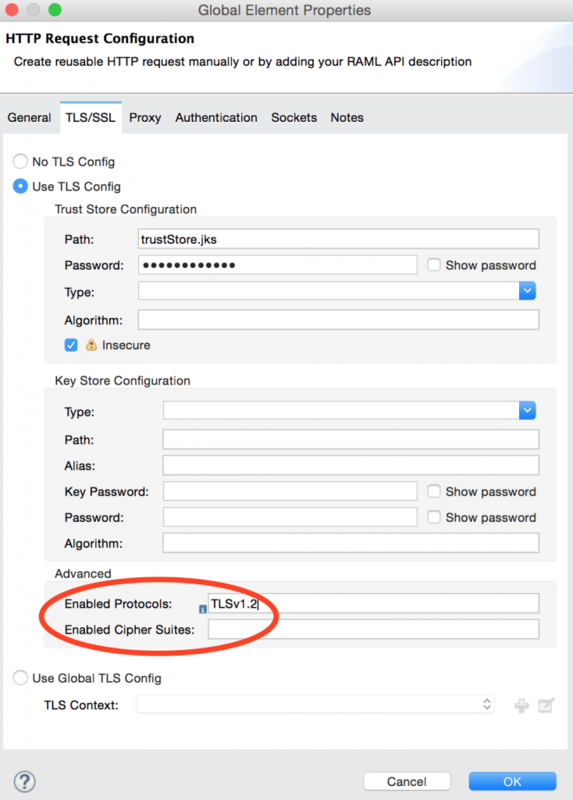 In it you can list the enabled protocols and cipher suites that the TLS connections established should respect, covering all applications at once. 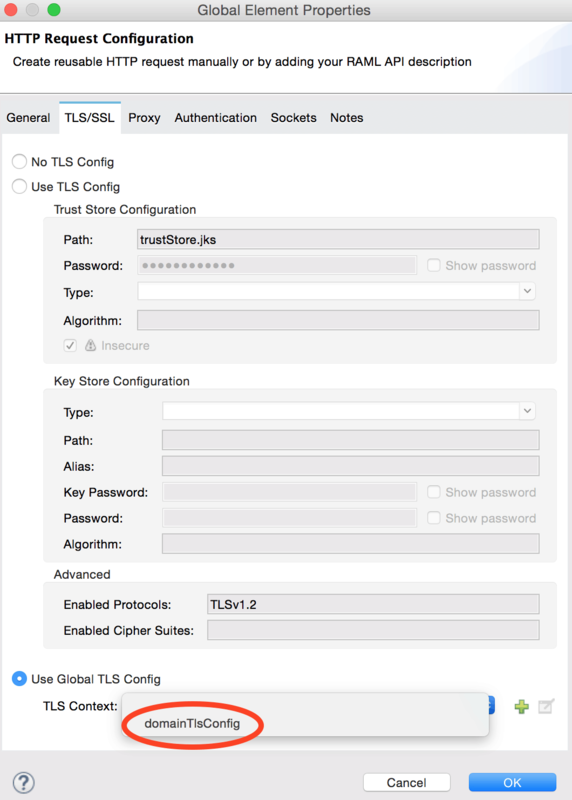 Below is the default one in 3.8, where you can notice TLSv1 is no longer included because of it’s known vulnerabilities. # default values of the current security provider will be used. # only use cipher suites that are provided in this list and supported by the current security provider. # that are provided in this list and supported by the current security provider. Now, however, you’ll be able to define your TLS context in a domain and share it with all apps in it. Your keystore and truststore along with their passwords will only need to be available for that domain and only the context name shared with the app owners. For example, if your app is part of the domain below you’ll be able to select “domainTlsConfig” as a global configuration for your HTTP requester. 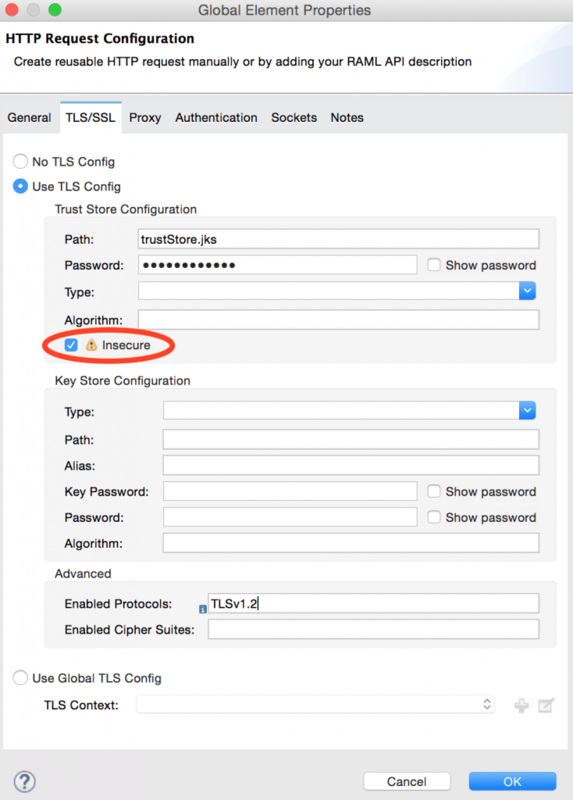 Configuring TLS was even more troublesome considering the time it may take to get a proper certificate signed or your truststore ready with a self-signed version. Thankfully, we have now added a way to disable certificate validation so that prototyping, development and testing are not held back by the truststore setup. Of course, this renders your connections vulnerable to attacks, so it should not be used in production environments. Does the community edition have support for TLS1.2 encryption? Hi, Orkun. Sorry for the late reply but yes, Mule CE does support TLS 1.2.